Free to use when crediting to www.prodigypestsolutions.com with a do-follow hyperlink. Brantford Pest Control, Your local pest control company in Brantford. Providing pest control or removing services to the residential & commercial sector, whether it is rodents, cockroaches, ants, fleas, bees, wasps, bed bugs, spiders, etc. Contact us & get affordable services or click brantfordpestcontrol.ca/. In the photos below and attached slides, well show you exactly what bed bugs look like on human skin, a close up of an infested mattress showing the entire life cycle, in a cup (gross), next to a ruler for size comparison, crawling on the floor, hiding in a headboard, and even one caught crawling out of a stocking! Because many of the pictures Im showing you are close ups, you might not realize how small they really are; an adult bed bug is the size of an apple seed except that it has legs and skin-piercing mouthparts to bite you with! And get this, when they are born, they are only a millimeter in size and because they are almost transparent, they blend in with the background (like your body). Attacked! These people are covered with horrible bed bug bites! Dont let their tiny size fool you into thinking theyre harmless! These little bugs know exactly where to hide, when and who (yes, they can be selective) to bite and have driven many of their victims insane. 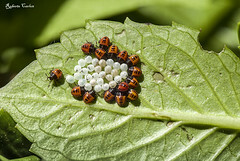 As you can see from the image below, this bug could easily be missed; the baby (1st instar) is extremely hard to find and is almost transparent until its first feeding! Notice how their body elongates and turn a reddish-brow color as they fill themselves with blood? Here is a close up photo of a blood filled bed bug that burst open into the hand of a person searching for an infestation. You can clearly see the eggs, whats left of the bug, and the blood coming in contact with skin and who knows where that blood came from! Before viewing the following slides, let me first give you an idea of what youll be looking at by showing you bed bugs caught in their natural habitat! Lets start with a close up picture of an entire life-cycle, from eggs, to shell casings, and finally to maturity. Keep in mind that this infestation went hidden for a very long time before being discovered! What a cute picture of these two bed bugs living the life! The big one shed his shell while the other looks toward the eggs. Another cure picture of bugs but the little little one appears to be shy and trying to hide. Notice the different sized shells, tells an entire story and helps give an idea of how long they have been hiding out there. This image is a great example of what youll look for when trying to spot an infestation. Simply lift up the mattress out of the frame and if you see something that looks like this, then you need to act, and fast! Send us a photo if you do! This was slide 1, there are more pictures of bed bugs, such as this one next to a ruler to give you an idea of how small these little blood suckers really are! 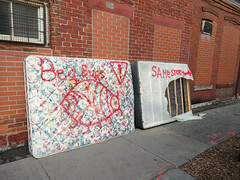 Also, check out these horrible pictures of bed bug bites when these bugs attack, they really do a number as they did on these people, and you never know it happened until the next morning! The best way to identify a bed bug infestation is to look for brownish red insects in your mattress. If you cant find the bedbugs themselves, look for yellow egg shells and clear case skins near your mattress edges. Bite marks around your ankles or feet could also indicate a bedbug infestation. 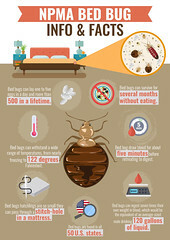 If you cant find these signs, but still think you might have an infestation, read on for more ways to identify bedbugs.